The ultimate morning-time wake up call, this ‘zingy’ facial polish is infused with soothing cucumber and peppermint, alongside a cocktail of blemish-battling, line-lessening and free radical-fighting actives which works to ‘deep clean’ lacklustre, congested complexions. Sufficiently gentle to use on the delicate neck and décolleté areas, this is serious about resurfacing – eliminating dead cells to reveal the plump, healthy new skin cells beneath. The nearest thing to Microdermabrasion in a tube, Alpha-H’s Micro Cleanse Super Scrub stars 12% glycolic acid alongside eco-friendly, biodegradable jojoba wax beads to refine your skin’s texture both chemically and physically – eliminating dulling, pore-clogging dead cells, dirt and debris for a super-smooth, luminous visage. The ‘beads’ burst as you massage the scrub over your complexion – releasing pure jojoba oil (with a molecular structure almost identical to skin’s own sebum) – to re-establish equilibrium and maintain moisture levels, while the inclusion of caffeine helps to tone and ‘tighten’ skin to reduce redness, inflammation and most other signs of stress. Suitable for normal, dry, oily and blemish-prone skin types, this diminishes the visibility of dark spots, scars and fine lines to leave skin looking enviably even, smooth and supple. Dampen face and apply exfoliant. Massage over the entire face, avoiding the eye area and remove with a warm damp face cloth. Apply exfoliant twice a week and follow with your preferred Alpha-H moisturiser. 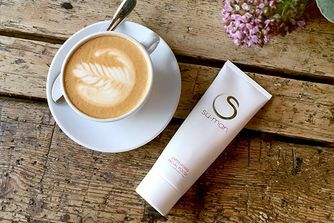 Is Your Skin In Need Of A Caffeine Fix? I had a tester of this one laying around and decided to try it before going to bed. I washed my face. Then gently applied this Micro Cleanse, left it on for a couple of minutes before rinsing it off. Then applied my serum, moisturiser, and oil. I woke up with the softest and clearest skin. I will buy a full size of this. Great stuff! This scrub has had be blown away since the first time I tried it. It doesn't have harsh beads, and feels great on the skin. No unpleasant smell, only slightly toothpaste'y. The real magic happens when its left on for 60 seconds and then rinsed off. I feel that my skin looks instantly better, and feels smooth as a baby's bottom. My pores were barely visible even after the first use. Will definitely repurchase when I run out. It doesn't tingle on my skin either, and I never feel dehydrated after rinsing it off. I really don't know what this hype is about. This is one of the worst exfoliators I have ever used. It is really harsh on the skin and it stings like hell. The results are poor, especially after all the suffering while using this product. I would never buy it again and really do not recommend it if you have any blemishes, rosacea, sensitive skin, or acne. This is a great product, I use it once weekly, and I just find it to be active enough to get the desired results, given it has that little bit of glycolic acid that works away. However, it is not super gritty so I don't feel like my face is being sandpapered, which I like, in comparison to some other micro cleanse products I have in my cupboard, for instance Origins Modern Friction (although that works well too). I always find that the day after I use this product, my skin glows. I do love Alpha-H, I have only been using say for 2 months now, but the results I have had are really exceptional. I have tried / researched millions of skincare brands and this for me ticks the right boxes for my mid-late 20s skin, as aging is starting to be the concern. I love the range as not only is it revealing brighter skin, but I don't get near as many break outs. I probably wouldn't buy their cleansers, serums or day creams again, as I would prefer something a bit more natural/organic, but I will definitely keep using the Micro Cleanse, the Liquid Gold, and the Rejuvenating cream. For me, Alpha-H is a staple in my night time routine and it will take a bit of convincing for me to change that I think! I use this scrub every single morning and it really preps my skin for the day. I have very oily, sensitive skin and although it sometimes stings slightly on an application it never feels 'stripped'. I think my super-oily skin needs more than just chemical exfoliation and this is the perfect combination of a gentle physical scrub which I then leave on for a couple of minutes to get the benefit of the chemical exfoliation too. I wash it off in the shower and then always clean AFTER with a balm/oil cleanser, which nourishes my skin and leaves it bouncy and beautifully smooth. I first got a sample of this, then I got a 30ml in the skincare kit and now I've purchased the full size. I have sensitive oily skin, prone to clogged pores and some hormonal breakouts now and then. Many scrubs, even those with AHA tend to make my skin flake and dry it out. This one doesn't. It removes the dead skin but leaves the face smooth, radiant and moisturized. I use it all the time and will repurchase. My mom with normal mature skin loves it too. After living for Liquid Gold, I've hit a new & firm skin care favorite in this 2-in-1 exfoliant. And what a divine thing this is - providing the refreshing and ensuring feeling of the manual exofliant (tiny beads) it also packs a punch with the fabulous glycolic acid. Honestly, I think I'd be lost without it as nothing has revealed new, clear skin like the Micro Cleanse does. No irritation, no blemishes, no dryness, no flaking, no redness. Just exceptionally smooth, clear skin. For reference, my skin is combo now leaning towards normal and possibly dehydrated. I used to suffer horrible, inflamed acne - I only wish I had this miracle back then! For me this does exactly what I wanted from Liquid Gold. I've shelved my bottle of Liquid Gold which I found too harsh and will be using this instead. Makes my skin so smooth. Easily my favourite exfoliant.